EA Studios has collected prints and carvings by Inuit artists for 3 decades. One of many striking images by Tivi Etook from George River. "The Shaman Protected the Village," 1975. Another George River artist, Peter Morgan, gives us The Harpoon, 1976. 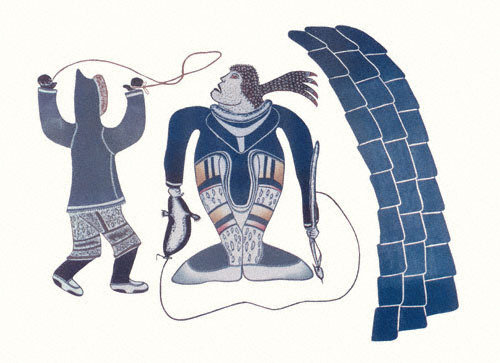 From Povungnituk, Syollie Amituk's A Loon Chasing A Fish Upstream, 1985. From Povungnituk, Josie P. Papialuk gives us Kayak Looking for Food. Asking for Food From Spirits is from Holman Island Artist, Elsie Klengenberg. They Protect Me by Ekidluak Komoartok, Pangnirtung, 1985. Seal and Bird Transformed is by Thomassie Echaluk, Inoucdjouac, 1976. From Povungnituk, we have An Eagle With Two Geese by Jackusi Itukala, 1984.